The Eiffel Tower Incident by Sir Steve Stevenson. An Agatha: Girl of Mystery Book. Review: Are you looking for a good mystery? Do you love to read about detectives? If you answered yes to either of these questions, you will definitely enjoy this book! 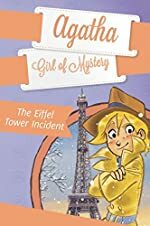 In Agatha, Girl of Mystery: The Eiffel Tower Incident, by Sir Steve Stevenson, Agatha, Dash, and Chandler are on an epic adventure! This is the 5th book in the series. In The Eiffel Tower Incident, a team consisting of Agatha (the mystery writer), Dash (the spy), and Chandler (the butler and former boxer), travel to Paris to solve a mystery! Because of Dash's carelessness, he has been put in charge of the case after he accidently injures the chief of spies. All three of them must work hard to catch the criminal who has killed Boris Renko in the Eiffel Tower! The team goes nonstop to find the murderer with only the slightest clue of Red Rose. Agatha, Dash, and Chandler race to find the suspect at the scene of the murder. After going to all the suspect's houses, the team figures out little clues step by step. If you'd like to find out how they solve the mystery, you'll just have to read the book! The Eiffel Tower Incident, is fun to read, and is mysterious at the same time. I really enjoyed the book. The author laid out the story very nicely. It is easy to read, and the chapters end at just the right times. For example, the author would end the chapter just before they are about to solve the crime, or right before they enter the murderer's house. I just couldn't put the book down. The entire mystery kept me on my toes and made me want to read more. I recommend this book to 9-11 year olds. The book's genre is realistic fiction. It is believable. This book is perfect for readers who are interested in mysteries. Review written by Annika (6th grade student). We would like to thank Penguin Young Readers Group for providing a copy of The Eiffel Tower Incident for this review. Have you read The Eiffel Tower Incident? How would you rate it?